I’ve had this book sitting on my shelf since I picked it up at a discount book sale during my undergrad years. Now that I’ve read it, I wish I’d read it sooner — it’s really moving. At the foundation of Lee’s novel is a huge question about what it means to be “related.” Most obviously, this manifests itself through the main character, Doc Hata, and his strained relationship with his adopted daughter, Sunny. But it’s there in other ways as well — Sunny’s son (Tommy) and his use of clowning to get others to like him, even to the point of almost dying; K and the relationship she forges with Hata based on their mutual “Koreanness;” Mary Burns and her attempts to integrate Doc Hata into her life (and the lives of the other Bedley Run inhabitants) — underlying the events of Doc Hata’s distant past, near past, and present. This question is interrogated by Sunny, who senses that Doc Hata needs her more than she needs him and isn’t afraid to confront him about that. It’s also complicated by his experiences in World War II as a Korean by blood, a Japanese by nationality, and a medic by trade. Questions about Doc Hata’s allegiances and ties — questions about who he owes what to — plague him throughout his entire life until finally, as an old man, he simply wants to have connections to somebody. But even that changes when, finally, he realizes he just wants to take care of the people he feels a connection with — to help their lives be easier for them. The title is also interesting. It’s Sunny who points out to Doc Hata that his life has been a life of gestures, a life of constant performance without deeper meaning. At first, it seems untrue and unfair since Doc is so apparently-beloved by everyone in Bedley Run. But as the novel wears on, this observation permeates the narrative, bleeding through into moments that should have depth (such as with his relationship with Mary Burns) but begin to seem transparent in their lack of it. 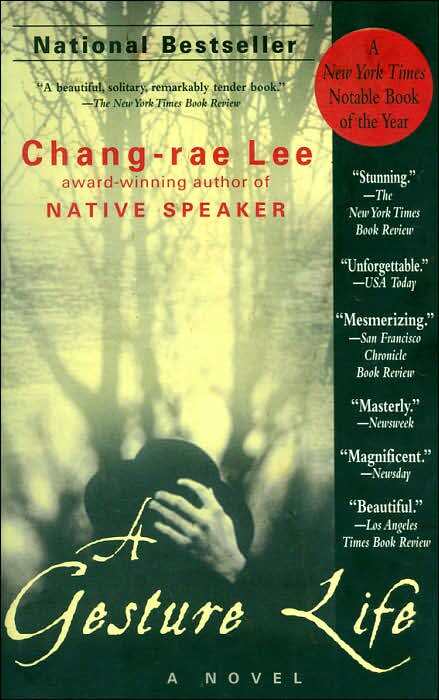 Lee’s use of analepsis has an interesting relationship with this “gesture life.” The novel exists in three different times: the distant past (WWII), the near past (Sunny’s childhood/adolescence), and the present (Doc Hata’s life alone in Bedley Run). At first, the novel takes place in the present. It doesn’t take long for the near past to start invading on that narrative, and we begin to get a better understanding of Doc Hata based on the information that seeps through about Sunny. However, the distant past doesn’t really start to become an issue until halfway through the novel when suddenly it is not only alluded to, but begins to occupy large sections of the narrative. About 2/3 of the way through the novel, the near and distant pasts almost blot out the present, leaving little space for it between them. The more we learn of Doc Hata’s past, the more it sort of makes sense that he lives his “gesture life” and keeps people at bay…and the more we begin to understand why he is the way he is (to an extent).